We are excited to introduce Stomping Ground Membership Levels! 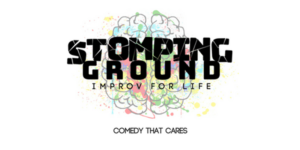 You can support our mission of enriching the community through comedy by becoming a an official “Member” of Stomping Ground. You can be a part of helping underserved members of our community, children, and those with special needs have access to our programming. For our nonprofit organization, membership dollars help underwrite scholarships and fund free community outreach. We currently offer outreach and scholarships to members of the community with autism, Alzheimerâ€™s and dementia and their caregivers, brain injury, anxiety, and those in the community who are underserved and would otherwise not have the opportunity to participate in our classes, workshops, and activities. We also offer â€œPay What You Canâ€ shows and workshops in order to make our programming accessible to students and families who may not otherwise have access to live theatrical performance and training. And we want to do so much more! Already in 2018, we have been able to offer free and discounted workshops and training to Dallas Children’s Advocacy Center, NonPareil Institute, Ed-U-Care Compassion Fatigue Conference, Huckleberry Foundation, Citysquare, and more. We have also been able to fund scholarships for members of the community who are caregivers to those with Alzheimer’s and dementia, those with autism and anxiety, and those who otherwise could not afford our therapeutic workshops and classes. Click here to check out our Memberships and learn how to become a part of enriching the community through comedy!